Background: Malaria is a serious disease and still remains a public health problem in many parts of Nigeria. Objectives: The aim of this study was to describe malaria transmission trends and analyzed the impact of climatic factors on malaria transmission in the highlands of Plateau State, Central Nigeria. Methods: The study was a retrospective survey which used archival data of climate parameters and medical case records on malaria. Rainfall, relative humidity, and temperature data were obtained from the nearest weather stations to the study locations from 1980 to 2015. Data on reported malaria cases were collected from general hospitals in the selected local government areas (LGAs) from 2003 to 2015. Generalized Additive Models were used to model trends in malaria incidences over time, and it is lagged association with climatic factors. 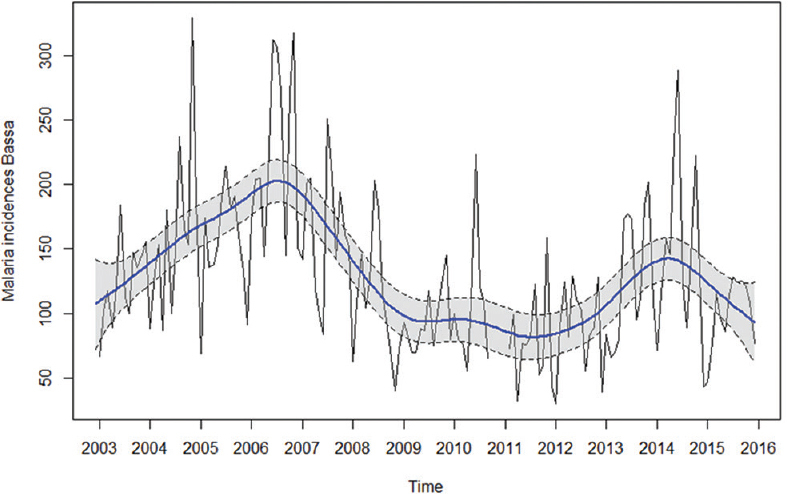 Results: The results show a significant cyclical trend in malaria incidence in all the study areas (P < 0.001). The association between monthly malaria cases and mean monthly temperature, rainfall, and relative humidity show significant association at different time lags and locations. Conclusion: Our findings suggest that climatic factors are among the major determinants of malaria transmission in the highlands of Plateau state except in Jos-North LGA where the low model deviance explained (35.4%) could mean that there are other important factors driving malaria transmission in the area other than climatic factors. Malaria is a serious disease and still remains a public health problem in many parts of Nigeria. According to the WHO, 212 million people were infected with human malaria parasites globally withAfrica accounting for about 90% of these cases in 2015. Eighteen countries together accounted for 90% of the total cases in sub-Saharan Africa with 37 million reported cases representing (29%) of these cases from Nigeria alone. It is estimated that about 97% of Nigerians are exposed to the danger of contracting malaria with the disease accounting for about 60% outpatient visitation at different health centers, 30% child and 11% maternal mortality making malaria the most important cause of mortality among children. Information on the impact of climate factors and reported malaria incidence in Nigeria is inadequate and not consistent.,, Furthermore, other than a simulation report (Ermert et al., 2012), there is no information on the impact of climate factors on malaria transmission in Plateau State, North-Central Nigeria to the best of our knowledge. In this report, it was projected that temperatures of ≤20°C in the Jos Plateau are likely to lead to lower transmission, shorter and delayed malaria transmission seasons. There is need to analyze the impact of climatic factors on the transmission of malaria in the highlands of Plateau State, North-Central Nigeria. This will further improve future malaria control programs if temperature, relative humidity and rainfall can be link with malaria transmission in the state. This will enable the government or policy makers to be more precise in formulating direct policies to address such occurrences. This was a retrospective study which involved the use of archival data of climate parameters (temperature, rainfall, and relative humidity) and medical case records on malaria from selected hospitals in three local government areas (LGAs) on the highlands of Plateau state, Central, Nigeria. The archival data on climatic factors were obtained from the Nigeria Meteorological Agency in Jos and Abuja and National Remote Sensing Centre in Jos, Plateau state for 31 (36) years from 1980 to 2015. Medical records of Malaria cases were obtained from the general hospitals in the selected LGAs for the study for 13 years from 2003 to 2015. This study was carried out in Plateau state, Nigeria. It is located in the North-Central geopolitical zone of the country and lies between latitudes 80°24'N and longitudes 80°32' and 100°38' east. 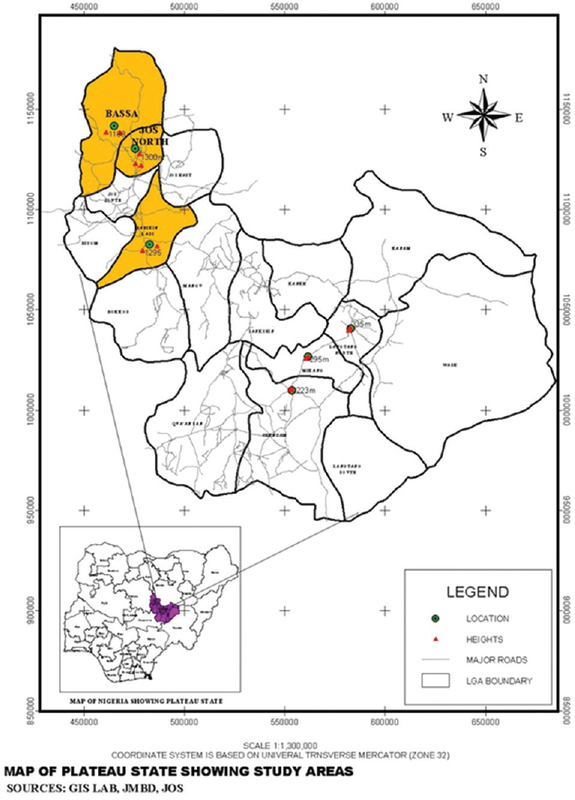 Three  LGAs, namely, Bassa, Jos-North and Barkin-Ladi LGAs were selected from the highlands (altitudes ≥1200 m above sea level) areas for this study [Figure 1]. 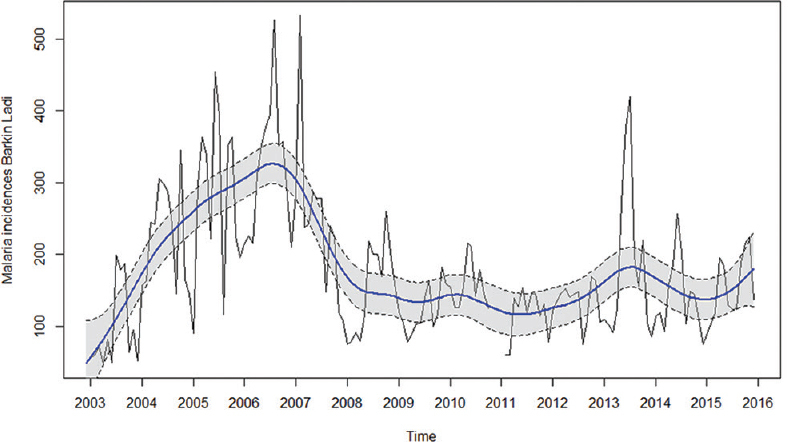 Generalized Additive Models (GAMs) were used to model trend in malaria incidences over time. GAMs are used to model trends as a smooth, nonlinear function of time, and provide a framework for testing the statistical significance of changes in malaria incidence over time. The inclusion of covariates into models is also another advantage of using GAMs for time series analysis, and the significance of covariates on the response are given. Covariates of mean monthly temperature, rainfall, and relative humidity were included in the models. The MGCV package version 1.8-7 (R Foundation for Statistical Computing, Vienna, Austria) for the R statistical package was used for the GAM analysis. For modeling malaria incidences at the different sites, several GAM models were considered. The first model tested the immediate effect of mean monthly temperature at time t, rainfall at time t, and relative humidity at time t on malaria cases at time t. In alternate models, the relationships between malaria cases with up to 6 months' lag (i.e., t-1–t-6 months) of the covariates were also tested. Smoothing term was applied to all covariates. The model with the best percentage deviance explained (simple measure of the quality of fit of a model) was then used for the analysis. Results clearly show that there was a significant cyclical trend in malaria incidences in Bassa, Jos-North, and Barkin Ladi LGAs between 2003 and 2015 (F = 13.2: P < 0.001; F = 6.5: P <0.001 and F = 19.7: P <0.001), respectively. A cyclical trend was evident in malaria incidences in Bassa LGAs between 2003 and 2015 as indicated in [Figure 2]. There was a steady rise in malaria cases in Bassa LGA from 2003 to 2006. The year 2007 witnessed a gradual decline. This fall remained stable until 2014 where it begins to rise again. A cyclical trend was also evident in malaria incidences in Jos-North LGA between 2003 and 2015 as indicated in [Figure 3]. There was a steady rise in malaria cases from 2003 to 2006 with a gradual decline in 2007. This fall was not sustained as malaria cases began to rise again to its peak in 2009. Years 2010–2012 witnessed a slight decrease in malaria cases, but it began to rise again in 2013–2015. The trend in malaria incidence between 2003 and 2015 in Barkin Ladi LGA was also cyclical as indicated in [Figure 4]. There was a steady increase in malaria cases from 2003 to 2006. The year 2007 witnessed a gradual decline. The decline from 2007 was sustained and remained stable to 2015. Malaria incidences in Bassa LGA were significantly affected by 3-month lagged precipitation, and 1-month lagged relative humidity. In Jos North LGA, malaria incidences were significantly affected by the average monthly temperature at 1-month lagged and 6-month lagged relative humidity. While in Barkin Ladi LGA, malaria incidences were significantly affected by 3-month lagged temperature and 5-month lagged precipitation. The deviance explained (a simple measure of the quality of fit of a model) 53.3%, 35.4%, and 62.7% of the association between malaria cases and climate variables in Bassa, Jos-North and Barkin Ladi LGAs, respectively [Table 1]. There was a steady increase in malaria cases in these LGAs from 2003 to 2006. This is consistent with a similar study in the northern Anhui Province of China by. They also reported an increase in malaria incidence after 2000 with annual incidence peaked in 2006. The increase in our study coincided with the period when the roll back malaria partners in Nigeria witnessed challenges of phenomenal increase in resistance of malaria parasites to drugs. Another major setback in the fight against malaria during this period was nonavailability of Insecticide Treated Nets (ITN) with ownership restricted to few households that could afford to purchase. Years 2007 and 2008 witnessed a gradual decline in malaria cases in all the LGAs. This decline could have resulted from the malaria control initiatives by government agencies and partners in the fight against malaria. This is in agreement with the report by. They reported that distribution of Long-Lasting Insecticide Treated Nets (LLIN) had a significant positive impact on malaria prevalence between 2007 and 2008 in Nigeria. In Barkin Ladi, the decline from 2007 was sustained and remained so till 2015. This is plausible because Barkin Ladi LGA is one of the malaria control centers established through the National malaria control program of the Nigerian Federal ministry of health. This center remained active to date, and this might have contributed to the sustained decline in malaria cases in the Local government area. The significant association between malaria incidence with 3-month lagged precipitation and 1-month lagged relative humidity in Bassa LGA were consistent with that of related study by. Their study conducted in Motuo County, Tibet demonstrated strong positive and significant correlations between malaria occurrence with relative humidity, rainfall, and temperature. In another study conducted in Ethiopia, positive correlation was reported between mean monthly rainfall and relative humidity with monthly malaria cases at 2–3 months lags. The association between malaria cases with relative humidity and temperature was complex in Jos-North LGA. The 1-month lag effect of temperature on malaria cases evident in the present study is comparable to that reported in Ethiopia and India., The lag effect of 1-month observed in this study is consistent with the time required for the development of mosquito vector and for completion of the parasite life cycles in the local vector mosquito. Since the effect of humidity was important at 6-month lag period, the part it would have played in the biological cycle of malaria can hardly be explained in this context. Although statistical significance alone does not always explain the complex biological dynamics involves in the development of the mosquito vectors and weather factors. Temperature and relative humidity have also been reported as the main drivers of malaria transmission in Yongcheng, China, between 2006–2010. In Barkin Ladi LGA, temperature and precipitation were significantly associated with the disease occurrence at 3 and 5 months lags, respectively. A positive association between malaria cases with precipitation and temperature has been reported in China. In Africa, similar findings in South Africa have been reported. Furthermore, related studies in Ethiopia indicate that temperature is significantly associated with the number of malaria cases. While the longer lagged effect of 5 months of rainfall on malaria transmission recorded in Barkin Ladi LGA appears to be unusual, more delayed lags of 6–7 months have been reported elsewhere by. They attributed such longer lag effects of rainfall to the climate of the area and the possibility of other water sources for the development and breeding of the vectors in addition to the rainfall. The same could be true in our study where the rainy seasons last for 6 months starting from May to October. In addition, there are many mining pounds in Barkin Ladi LGA that may act as permanent breeding grounds for Anopheles mosquitoes. This may reduce the effect of rainfall leading to the long delayed effect of rainfall on malaria transmission. The model deviance explained was 62.7%. This means that climatic factors are the major determinant of malaria prevalence in Barkin Ladi LGA. The study established a significant cyclical trend in reported malaria cases in all the LGAs between 2003 and 2015. Significant associations between mean monthly rainfall, relative humidity and temperature with malaria incidences at different time lags and locations were established. In Jos-North LGA, the low-model deviance explained (35.4%) could mean that there are other important factors driving malaria transmission in the area other than climatic factors. World Health Organisation. World Malaria Report 2016. Geneva: World Health Organisation; 2016. National Malaria Control Programme (NMCP) [Nigeria]. National Malaria Control Programme; 2015. Available from: http://www.nmcp.gov.ng/. [Last accessed on 2015 Apr 20]. Hay SI, Rogers DJ, Randolph SE, Stern DI, Cox J, Shanks GD, et al. Hot topic or hot air? Climate change and malaria resurgence in East African Highlands. Trends Parasitol 2002;18:530-4. Nabi S, Qader S. Is global warming likely to cause an increased incidence of Malaria? Libyan J Med 2009;4:18-22. Omumbo JA, Lyon B, Waweru SM, Connor SJ, Thomson MC. Raised temperatures over the Kericho tea estates: Revisiting the climate in the east african highlands malaria debate. Malar J 2011;10:12. De Silva PM, Marshall JM. Factors contributing to urban malaria transmission in Sub-Saharan Africa: A systematic review. J Trop Med 2012;2012:819563. Winzeler EA, Manary MJ. Drug resistance genomics of the antimalarial drug artemisinin. Genome Biol 2014;15:544. Wu Y, Qiao Z, Wang N, Yu H, Feng Z, Li X, et al. Describing interaction effect between lagged rainfalls on malaria: An epidemiological study in South-West China. Malar J 2017;16:53. Institute of Medicine. Climate Change, the Indoor Environment, and Health. Washington, DC: The National Academies Press; 2011. p. 287. World Health Organisation. Climate Change and Human Health: Risks and Responses; Geneva, Switzerland: ??? ; 2002. Tanser FC, Sharp B, le Sueur D. Potential effect of climate change on malaria transmission in Africa. Lancet 2003;362:1792-8. Eling W, Hooghof J, van de Vegte-Bollmer M, Sauerwein R, van Gemert GJ. Tropical temperatures can inhibit development of the human malaria parasite Plasmodium falciparum in the mosquito. Proc Exp Appl Entomol 2001;12:151-6. Apiwathnasorn C. Climate change and mosquito vectors. J Trop Med Parasitol 2012;35:78-85. Pascual M, Cazelles B, Bouma MJ, Chaves LF, Koelle K. Shifting patterns: Malaria dynamics and rainfall variability in an African Highland. Proc Biol Sci 2008;275:123-32. Ermert V, Fink AH, Morse AP, Paeth H. The impact of regional climate change on malaria risk due to greenhouse forcing and land-use changes in tropical africa. Environ Health Perspect 2012;120:77-84. Kim YM, Park JW, Cheong HK. Estimated effect of climatic variables on the transmission of plasmodium vivax malaria in the republic of Korea. Environ Health Perspect 2012;120:1314-9. Arab A, Jackson MC, Kongoli C. Modelling the effects of weather and climate on malaria distributions in West Africa. Malar J 2014;13:126. Efe SI. Climate variation and malaria prevalence in Warri metropolis. Atmos Clim Sci 2013;3:132-40. Nwagbara MO, Aruocha C. Effects of climate change on malaria occurrence and food security in the humid tropics : An example from Umuahia-South, Southeastern Nigeria. Int J Environ Sci Toxicol Res 2015;3:43-8. Omonijo AG, Matzarakis A, Oguntoke O, Adeofun CO. Influence of weather and climate on malaria occurrence based on human-biometeorological methods in Ondo State, Nigeria. J Environ Sci Eng 2011;5:1215-28. Wood SN. Generalized additive models: An introduction with R. Texts Statistical Science Series. In: Raton B, editor. : Chapman & Hall; 2006. p. 392. Woods SN. Package “mgcv” Ver. 1.8-7. Vienna: R Foundation for Statistical Computing; 2015. p. 273. Gao HW, Wang LP, Liang S, Liu YX, Tong SL, Wang JJ, et al. Change in rainfall drives malaria re-emergence in Anhui Province, China. PLoS One 2012;7:e43686. Federal Ministry of Health. Federal Ministry of Health, National Malaria Control Programme, Abuja, Nigeria. Strategic Plan 2009-2013. A Road Map for Malaria Control in Nigeria DRAFT 16 June, 2008. Jos; 2008. Onwujekwe O, Hanson K, Fox-Rushby J. Inequalities in purchase of mosquito nets and willingness to pay for insecticide-treated nets in Nigeria: Challenges for malaria control interventions. Malar J 2004;3:6. Center C. Annual Malaria Control Program Review Enhancing Impact Through Integrated Strategies Malaria Programs Ethiopia And Nigeria. Atlanta, Georgia; 2010. Afolaranmi TO, Hassan ZI, Bello DA, Tagurum YO. Health education as a tool for improving the knowledge of Malaria and long lasting insecticide treated nets among people living with HIV/AIDS in Bassa local government area of Plateau state, North Central Nigeria. E3 Journal of Medical Research 2015;4:1-7. Berrang-Ford L, Maclean JD, Gyorkos TW, Ford JD, Ogden NH. Climate change and malaria in Canada: A systems approach. Interdiscip Perspect Infect Dis 2009;2009:385487. Guo C, Yang L, Ou CQ, Li L, Zhuang Y, Yang J, et al. 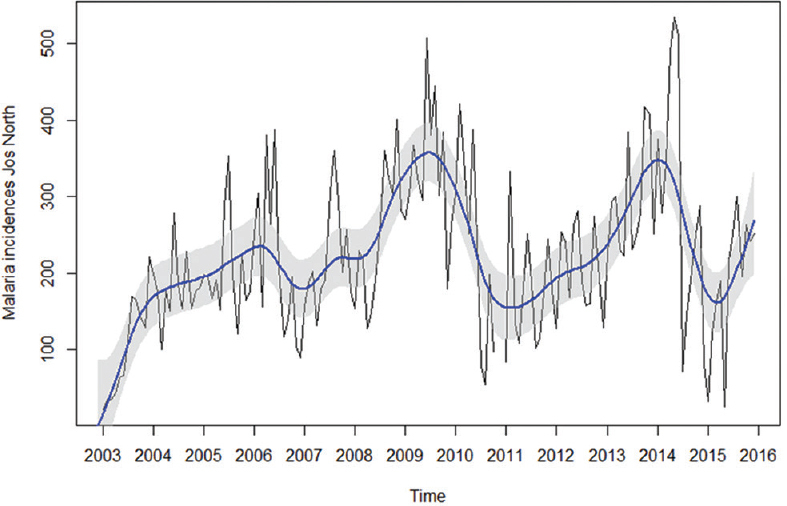 Malaria incidence from 2005-2013 and its associations with meteorological factors in Guangdong, China. Malar J 2015;14:116. Huang F, Zhou S, Zhang S, Wang H, Tang L. Temporal correlation analysis between malaria and meteorological factors in Motuo County, Tibet. Malar J 2011;10:54. Midekisa A, Beyene B, Mihretie A, Bayabil E, Wimberly MC. Seasonal associations of climatic drivers and malaria in the highlands of Ethiopia. Parasit Vectors 2015;8:339. Peterson AT. Shifting suitability for malaria vectors across Africa with warming climates. BMC Infect Dis 2009;9:59. Kumar DS, Andimuthu R, Rajan R, Venkatesan MS. Spatial trend, environmental and socioeconomic factors associated with malaria prevalence in Chennai. Malar J 2014;13:14. Bhattacharya S, Sharma C, Dhiman RC, Mitra AP. Climate change and malaria in India. Curr Sci 2006;90:369-75. Haque U, Hashizume M, Glass GE, Dewan AM, Overgaard HJ, Yamamoto T, et al. The role of climate variability in the spread of malaria in Bangladeshi highlands. PLoS One 2010;5:e14341. Zhang Y, Liu QY, Luan RS, Liu XB, Zhou GC, Jiang JY, et al. Spatial-temporal analysis of malaria and the effect of environmental factors on its incidence in Yongcheng, China, 2006-2010. BMC Public Health 2012;12:544. Gething PW, Battle KE, Bhatt S, Smith DL, Eisele TP, Cibulskis RE, et al. Declining malaria in Africa: Improving the measurement of progress. Malar J 2014;13:39. Bui HM, Clements AC, Nguyen QT, Nguyen MH, Le XH, Hay SI, et al. Social and environmental determinants of malaria in space and time in Viet Nam. Int J Parasitol 2011;41:109-16. Bi P, Tong S, Donald K, Parton KA, Ni J. Climatic variables and transmission of malaria: A 12-year data analysis in Shuchen County, China. Public Health Rep 2003;118:65-71. Komen K, Olwoch J, Rautenbach H, Botai J, Adebayo A. Long-run relative importance of temperature as the main driver to malaria transmission in Limpopo Province, South Africa: A simple econometric approach. Ecohealth 2015;12:131-43. Teklehaimanot HD, Lipsitch M, Teklehaimanot A, Schwartz J. Weather-based prediction of Plasmodium falciparum malaria in epidemic-prone regions of Ethiopia I. Patterns of lagged weather effects reflect biological mechanisms. Malar J 2004;3:41. Ostovar A, Haghdoost AA, Rahimiforoushani A, Raeisi A, Majdzadeh R. Time series analysis of meteorological factors influencing malaria in South Eastern Iran. J Arthropod Borne Dis 2016;10:222-36.